Unexpected and sudden smells, sounds or sights can take us make immediately to past places, bringing back memories that we think are long-forgotten. 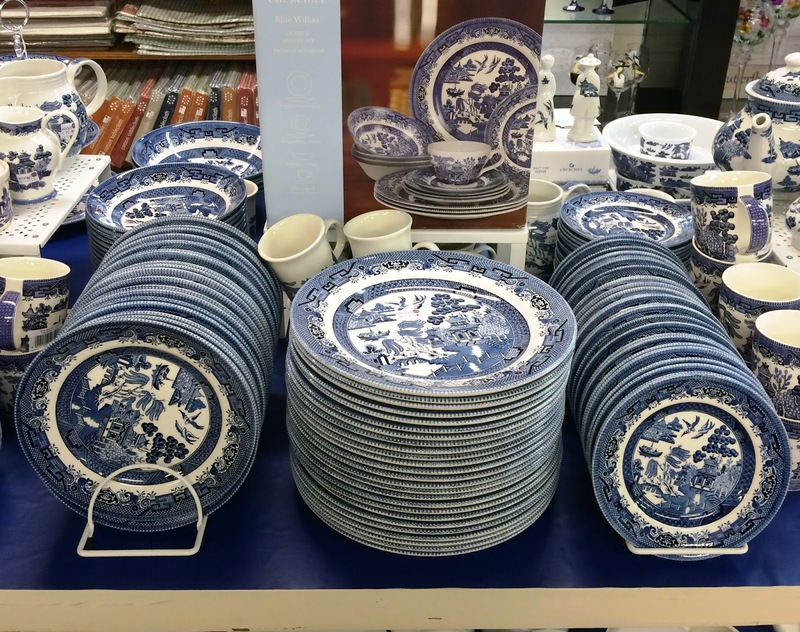 Twice in recent weeks, walking through the narrow aisles of shops I would never plan to visit – once in Foxford, Co Mayo, last month and then once again last week in Bray, Co Wicklow – I found myself face-to-face with displays of Willow Pattern plates and platters, mugs and cups. And I realised I was startled … not by their sudden appearance but by the sudden recall of houses I had lived in as a child. In quick, short bursts of recollection, I recalled my grandmother’s farmhouse in Co Waterford, and a childhood home in Dublin. 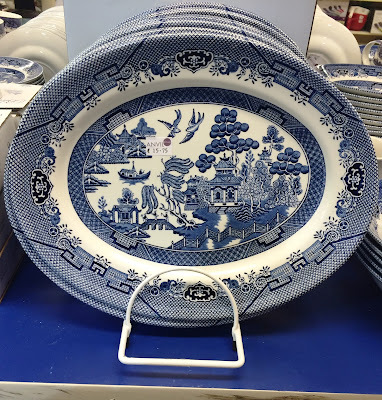 I thought the Willow Pattern had so gone out of fashion that it was no longer on sale. Perhaps it survived in a lonely, isolated surviving plate here and there. And then I realised how popular it was on ceramic and popular kitchen ware, and must have been commonplace in every family home in England and Ireland well into the 1950s, perhaps even the 1960s. 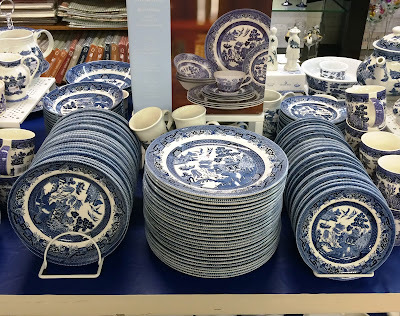 I remember Willow Pattern plates and platters on dressers in our own family homes, and then I recalled being told the story or the fable that embellished and decorated the cups and saucers. Not once but twice these memories came back in a sweet rush, and I remembered being told those stories with assurances of affection and love. But as I looked into the story of the Willow Pattern, why was I surprised too to find that there was a thread that lead me back to Pugin, the Gothic revival and the intellectual circles in the English Midlands in the late 18th and early 19th centuries? The Willow Pattern is an oriental pattern, most often seen in blue and white, that features common elements from manufacturer to manufacturer. These elements are a willow tree, an orange or apple tree, two birds, people on a bridge, a fence, a boat and a teahouse or pagoda. The Willow Pattern has been made by hundreds of companies in dozens of countries, and in colours from the most-seen blue, to red, green, gold, yellow, purple, black, brown, multi-coloured and the list goes on with combinations. Some accounts say the Willow Pattern was first designed by Thomas Turner of Caughley in Shropshire in 1780. Others say it was created ten years later by Josiah Spode or that it was the work of Thomas Minton around 1790. Thomas Turner (1747-1809) was the eldest son of the Revd Richard Turner (1724-1791), vicar of Elmley Castle, Worcestershire. It has been supposed that Thomas was brought up as a silversmith. He was involved in porcelain manufacture, and was a skilful draughtsman, designer, and engraver, as well as being an accomplished musician. He was a magistrate for Shropshire and Staffordshire, and a freeman of Worcester, Much Wenlock, and Bridgnorth. In 1772, he succeeded his father-in-law at his pottery works at Caughley, known as The Salopian China Warehouse. After visiting France in 1780, he introduced the Willow Pattern to England. He died in 1809, and the business was finally abandoned in 1814 or 1815. The potter Josiah Spode (1733-1797) was the founder of the Spode pottery works and is often credited with the establishment of blue underglaze transfer printing in Staffordshire in 1781-1784, and is said to have designed the Willow Pattern from a pattern called Mandarin in about 1790. The potter Thomas Minton (1765-1836) founded Thomas Minton & Sons in Stoke-on-Trent, which grew into a major ceramic manufacturing company. In the early 1780s, Minton was an apprentice engraver at the Caughley Pottery Works in Shropshire, working under Thomas Turner, working on copperplate engravings for the production of transfer-wares. The Caughley engraver Thomas Lucas went to work for Josiah Spode at Stoke-on-Trent in 1782, taking some elements of the fashionable chinoiserie patterns with him. At Caughley, it is claimed, Minton worked on the original design of the true willow pattern, and prepared the first copperplates of it. After Minton left Caughley in 1785, variations of the original design were acquired by Spode, Wedgwood, Adams, Davenport and others. 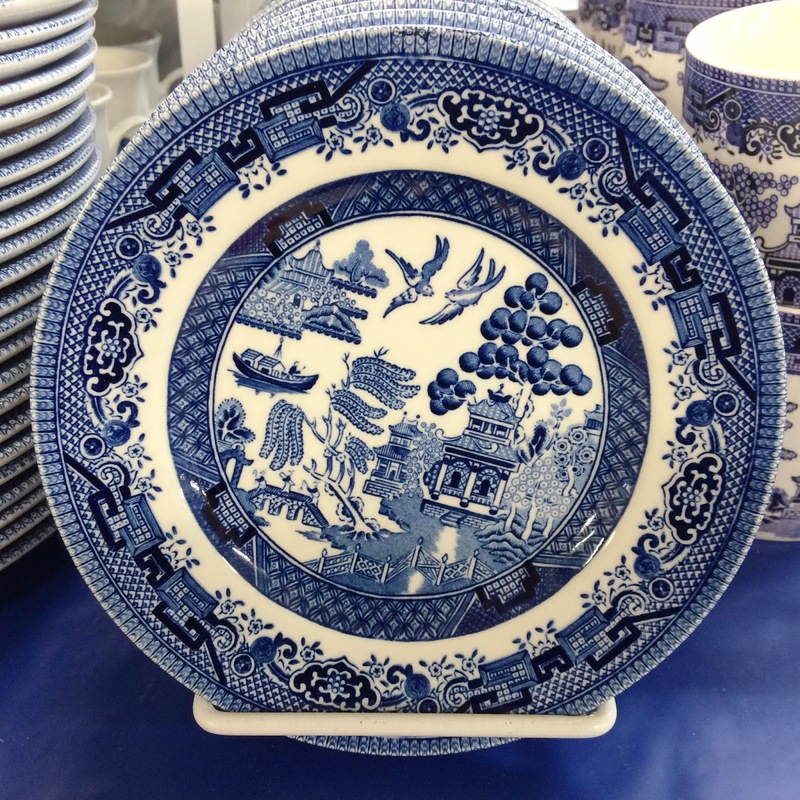 He worked for Josiah Spode, and it was for him that he engraved a new version of the willow pattern. In 1793, Minton established his own pottery factory in Stoke-upon-Trent, where his products included the Willow Pattern, and fine ornamental chinaware. When Minton died in 1836, he was succeeded by his son Herbert Minton (1793–1858) who developed new production techniques and took the business into new fields, including decorative encaustic tile making, through his association with leading architects and designers including the Gothic Revival architect AWN Pugin. Pugin worked closely with Herbert Minton and John Hardman (1811-1867), the Birmingham metalwork manufacturer, in carrying out his great building and decorative schemes, from the Palace of Westminster to small country churches and houses, and Pugin’s own family home at Ramsgate. Between 1844 and 1854, Herbert Minton presented encaustic floor tiles to a total of 46 churches and vicarages in Staffordshire, and over 150 churches in the Diocese of Lichfield were supplied with Minton pavements by 1859. They included Lichfield Cathedral. There are Minton tiles too in many of Pugin’s Irish churches and cathedrals, including Saint Aidan’s Cathedral, Enniscorthy, Saint Mary’s Cathedral, Killarney, and Saint Mary’s Church, Tagoat. In order to sell Minton’s Willow Pattern, stories were invented to fit the design, and despite the legends, the story is completely English in origin, and has no links to China. Nonetheless, the romantic fable is worth telling. Once there was a wealthy Mandarin, who had a beautiful daughter called Koong-se. She had fallen in love with her father’s humble accounting assistant, Chang. But her father was angry for it was inappropriate for them to marry because the difference in their social class. The father sacked young Chang and built a high fence around his house to keep the lovers apart. The Mandarin was planning to marry Koong-se off to a powerful Duke. The Duke arrived by boat to claim his bride, bringing a box of jewels as a gift. The wedding was to take place on the day the blossom fell from the willow tree. On the eve of Koong-se’s wedding, Chang dressed himself up as a servant and slipped into the palace unnoticed. As the lovers escaped with the jewels, the alarm was raised. They ran over a bridge, chased by the Mandarin, with a whip in his hand. Eventually the two lovers escaped on the Duke’s ship to safety on a secluded island, and there they lived happily for years. However, the Duke learned one day that they had been found on the island. Seeking revenge, he sent soldiers, who captured the lovers and put them to death. But the gods were moved by their plight and turned the lovers into a pair of doves. And so, although they both perished, the gods were touched by their love and immortalised them as two doves, eternally flying together in the sky. Thomas Minton’s design has been followed by Royal Worcester, Spode, Adams, Wedgwood, Davenport, Clews, Leeds and Swansea. But there have been changes to the Willow Pattern over the years. The original Chinese Willow by Minton had no bridge with people crossing over, and it is not sure whether the stories connected with it originated in China or England. The original did not have the apple-tree or the two doves. These were added later. Other differences include the treatment or the fretted border, with either a lattice work or conventional butterfly, and details of the fence in the foreground. 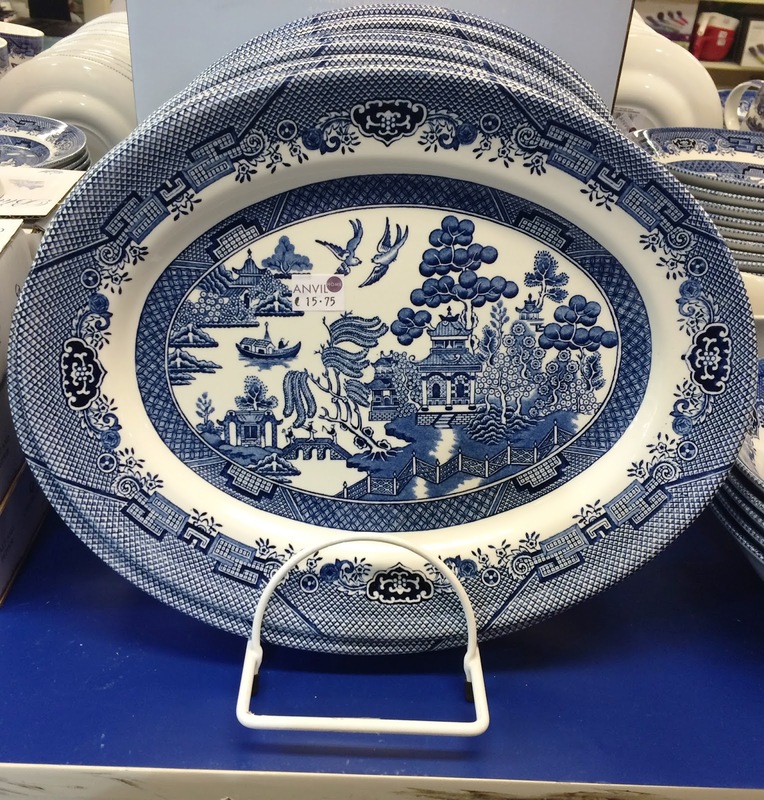 For a century and a half, the Willow Pattern has been the stock-pattern of nearly every British pottery manufacturer. Although its popularity has waned at times, I realised after seeing it once again in Bray and Foxford that it has returned to favour once again and is as popular as it ever was.